Join us every Wednesday night for Prayer Meeting and Pastor's Hour beginning at 7pm. Enjoy dinner from 5pm to 6pm. Antioch School of the Bible Classes are held on Wednesdays from 6:00pm until 6:50pm. Spiritual Nourishment And Christian Kare, Selah! Looking for your "place" here at Antioch? We have lots for you to choose from... Click here and Get Off the Pew! We are blessed that you've chosen to visit with us today. We pray that you will receive a blessing from our website and hope that you can join us in person soon. Pastor Alexander wants you to know that Antioch is Bible-based, Christ-centered, Holy Spirit-led and Mission-bound. We thank you for stopping by and extend to you a special invitation to visit again. Our site is updated regularly with new and exciting events all targeted toward the uplifting of the name of the Lord! Sign up for Antioch's Email List. 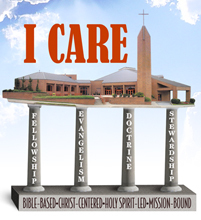 Antioch members who have family members in the armed forces who are serving in Iraq or Afghanistan, or who are convalescing are asked to provide their name and contact information to our Care and Comfort Ministry so that we may lift them up in prayer. 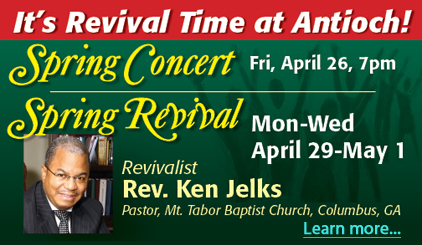 Call the church office at 404-688-5679 for information. Volunteers are needed to support the Nursery (ages 2-4) and Children’s Church (ages 5-12) during Sunday services. Each volunteer must be at least 18 years or older and is asked to serve one Sunday per month. Parents of the children who utilize these services are encouraged to volunteer. Please contact Sis. Andrea Harton at 404-688-5679 to sign-up or receive additional information. The Church at Antioch newsletter. Current and past issues available here. If you have newsworthy information that you'd like to have displayed in the newsletter, contact Gracie Staples at gstaples@ajc.com. We'll try our best to get it in our next issue.